NEW YORK—An increasing number of dairy farmers in New York state are discovering an ecological solution to deal with their large amounts of manure. A technology called anaerobic digestion converts dung into gas, known as biogas. The renewable fuel can be used to generate electricity for the farm, helping farmers save on operation costs and reducing manure odor. Bob Aman is owner of AA dairy farm in Tioga County and a pioneer in using an anaerobic digester at his operation. Whenever Aman used to spread liquid cow manure out on his fields, the pervasive odor would upset the local community. Motivated to change this, in 1998 he overcame some financial and technical challenges to build an anaerobic digester. Fourteen years later, Aman is satisfied with his decision. Besides effective odor reduction, the digester provides for electricity. The farm saves up to $4,000 on fuel and electricity costs each month. Aman also makes some profit from taking on food waste from a local cheese factory and the sale of the separated manure solids as organic compost. According to Jenny Pronto, a research assistant with the PRO DAIRY Environmental System Group at Cornell University, who has been advising farmers on digesters for five years, odor control is the primary motivation for farmers in New York state to use such a technology. Without the process of digestion, farmers usually spread the raw liquid manure directly on their fields. With digestion, they still have liquid manure fertilizer for the fields, but the smell has been significantly reduced through the digestion process. On Aman’s farm, the tens of thousands of gallons of dung that accumulates every day are channeled into a sealed underground chamber of the digester, where bacteria work at the right temperature on it constantly. Besides the biogas that is used to power an engine-generator set, liquid and solid effluents come out at the other end. These are near odor-free fertilizer. While they bring additional complexity to farming by adding extra steps to manure management and a system that needs to be maintained, the anaerobic digester technology is no barrier to further implementation of farm digesters. “It works. … It is very effective,” Pronto remarked. Setting up a digester involves a hefty investment—$1 million for the average dairy farm. Government grants dedicated to anaerobic digestion are consistently available. 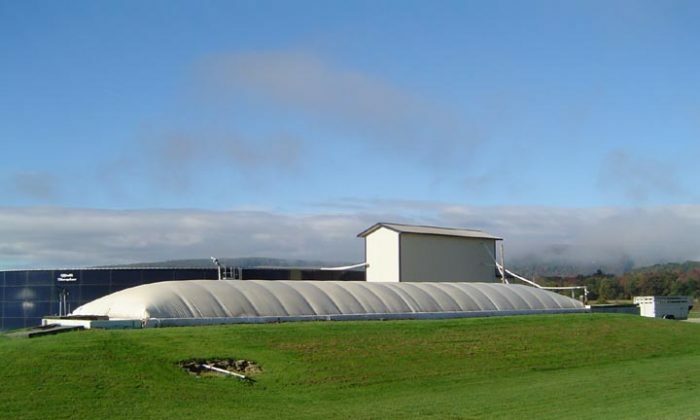 In November, NYSERDA announced an additional $57 million in funding in support of anaerobic digesters, which will mostly benefit farms. Since the capital costs are the “No. 1 problem,” according to Pronto, this funding is crucial. Almost all farmers using digesters received funding from NYSERDA. Connie Patterson, who owns a dairy farm in Cayuga County, built a digester in 2005. Patterson received $1.2 million, about 88 percent, from several state and federal authorities, while the NYSERDA contribution was the largest chunk. “Our digester would not have been built without grant funding,” she observed. Thanks to the effective technology and the funding that makes it possible, the trend in New York state is in favor of this technology. While currently 18 farmers in New York, mostly dairy farmers have anaerobic digesters in operation, six more are in the process of being constructed, and another 15 farms have applied for a grant.